Our blind justice statue comes blindfolded armed with a sword and the scales of justice. Her robes are distinguished enveloping her body with detailed folds as she stands valiantly atop a marble base. 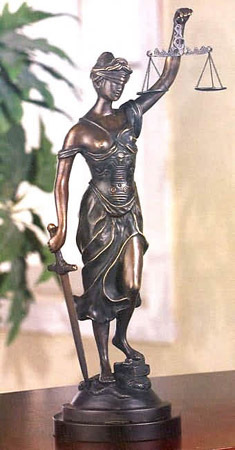 This Blind Justice statue is an impressive gift idea for a legal professional or law student. Made of brass and comes on a marble base. Normally ships in 1-2 weeks. Limited Stock!